We eat a lot of tofu! I use it in both sweet and savory dishes. 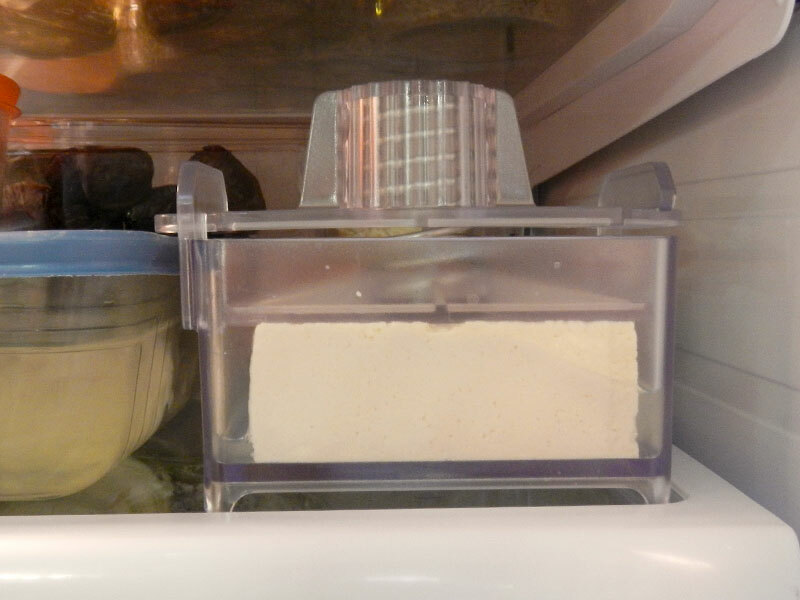 That means I’m doing a lot of pressing, to squeeze the water out of the block of tofu. You probably saw the post here about the standard, low-tech way of pressing it. It works, but it’s messy and leaves me with a lot of stuff to wash. It also uses a lot of paper towels. I recently got a TofuXpress! 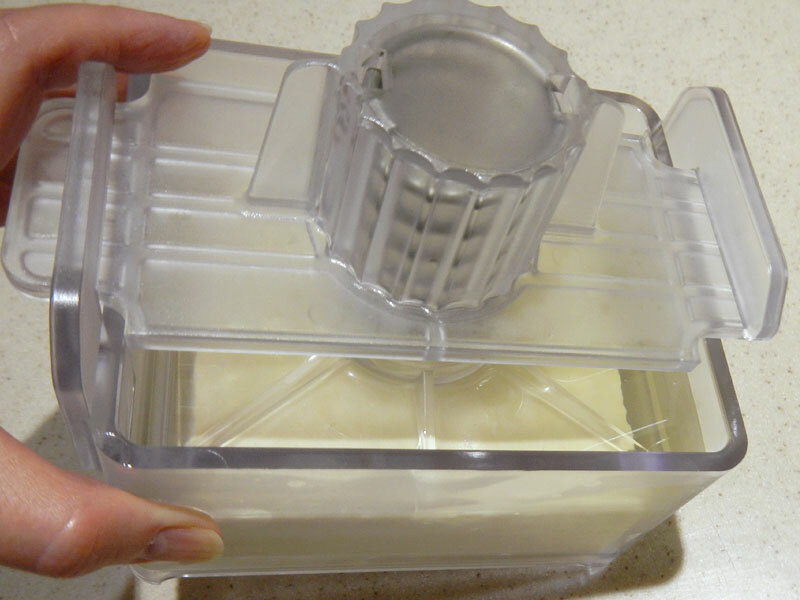 This handy gadget presses the water out of the blocks with way less mess and fuss! Here’s what came in my kit. 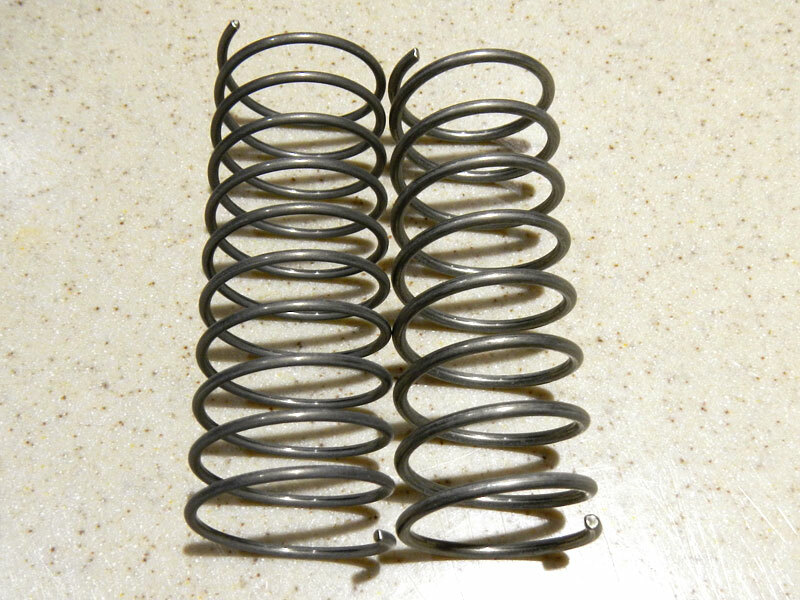 I got the kit with the regular spring (on the left, below) and the lighter tension spring. It came with an instruction and recipe booklet for each spring, two Nasoya coupons, and one recipe card. And a sheet with the usual warnings. The springs are stainless steel. 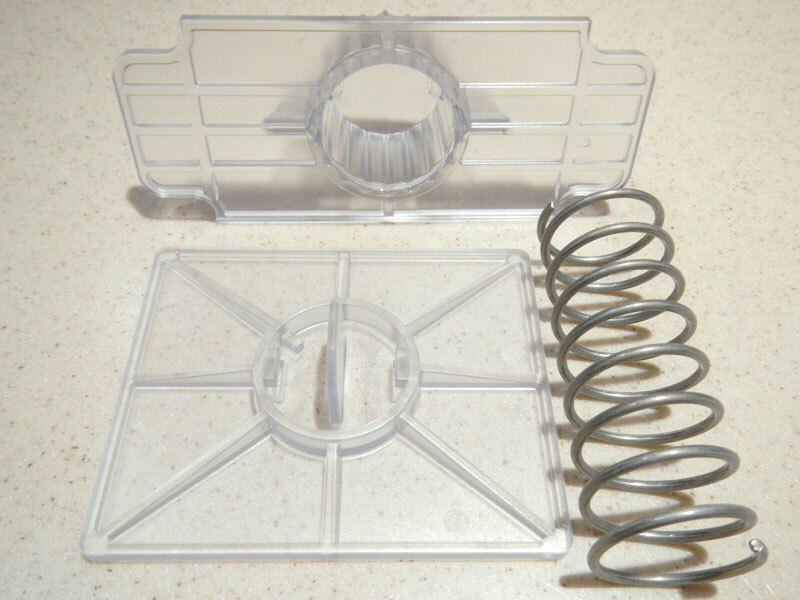 You select which spring you want to use (normally the regular one) and fit it under the tabs in the cover and pressing plate. Hold the spring upright and insert into the piece, lining up the end of the spring with the unblocked tab. Then rotate it, like a screw, until the end hits the block at the other tab. Repeat for the other plate. 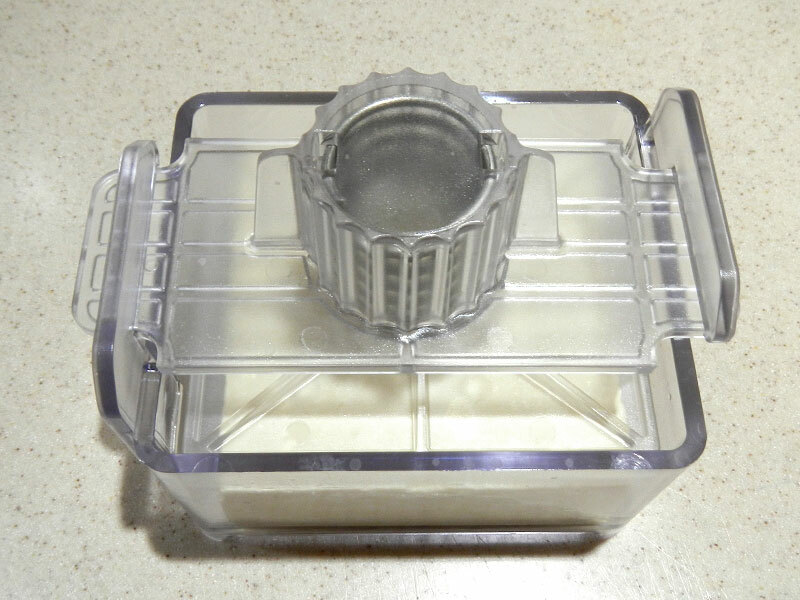 The assembled cover is held in place by two flanges on either side of the container. It also comes with a marinating cover. 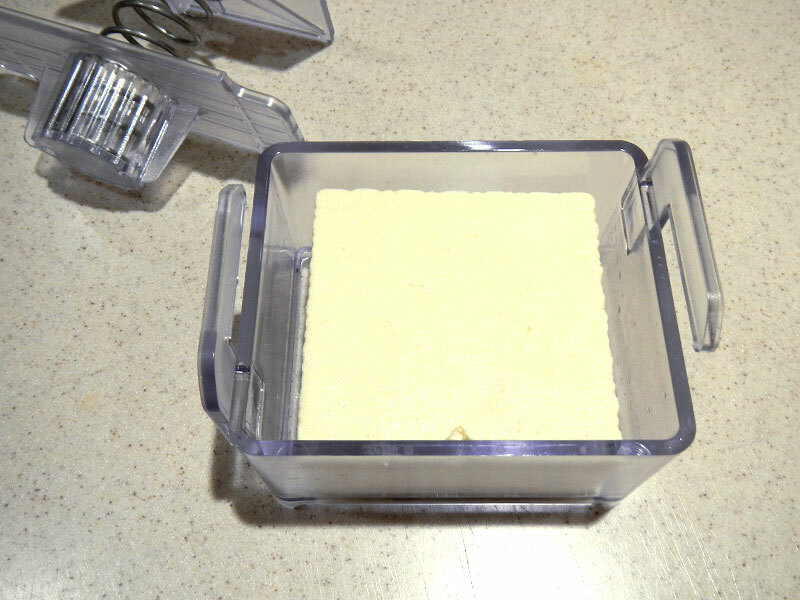 After you have pressed your tofu, you can drain out the water and add your marinating liquid. 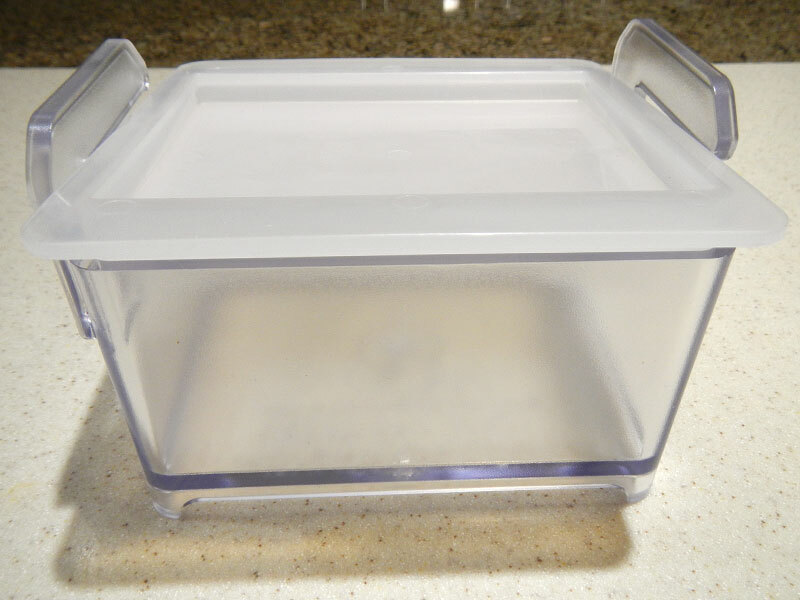 Put the cover on top, and put in the refrigerator until you’ve ready to use it. When you’re storing the unit, the marinating cover attaches to the bottom of the box, so you can keep everything together. I think that’s really handy because I hate looking all over for the covers for containers! 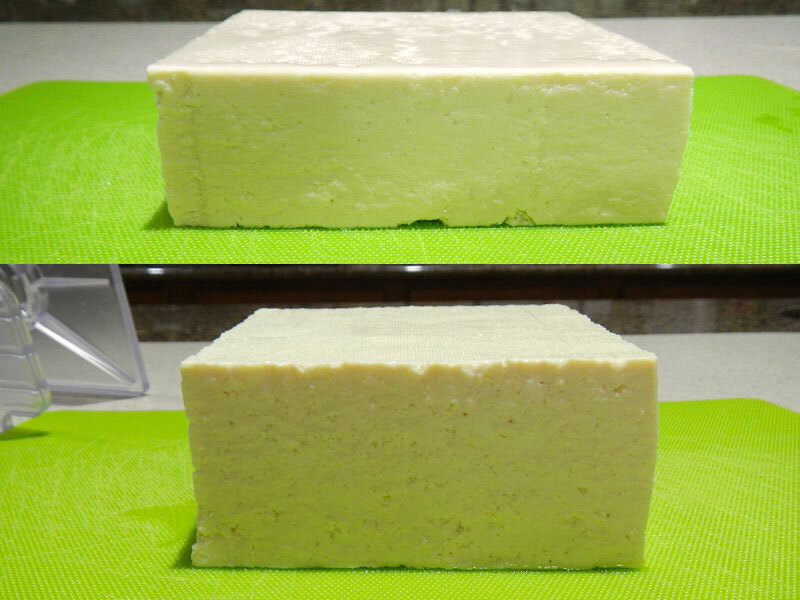 As a test, I decided to press a block of extra firm tofu. When I press this using the standard method, it really doesn’t compress very much, so I figured this would make a good comparison. I opened the package and drained the water. I rinsed off the tofu and put it in the unit. 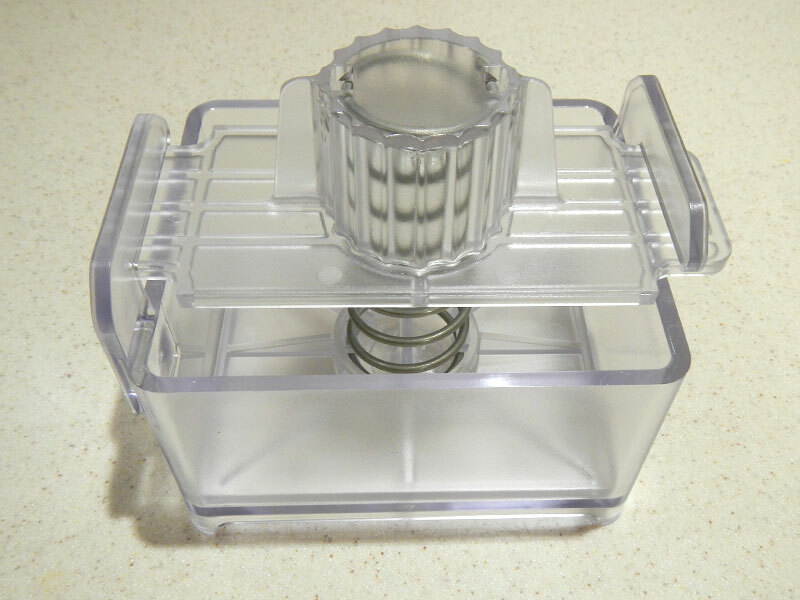 To put on the cover, insert the pressing plate into the box, rotate the top so that you can press down and slide it under the flanges. Make sure it’s all the way on. At the end, it will “click” into place. Then you can put the entire unit in the refrigerator. I put it in over night. The next day, when I took it out, I was kind of surprised at how much water it actually pressed out! You can see a little bit on the sides in the picture above. But here’s how much there was the next day! Clean up was easy. It says on the website that all of the parts are dishwasher safe. I didn’t try it because I just washed everything in the sink with warm, soapy water. No problems at all. The unit is very well made, strong and sturdy. All the parts store together, snapping the marinating cover to the bottom and putting the rest of the parts in the unit. I think it should last quite a while. It is on the pricy side, though. You can order it from Amazon for $47.90, but it’s not Prime. That means you’ll be paying additional shipping on top of the price. In addition, the order is going through TofuXpress anyway. If you order it directly from the company’s online store, the price for the one I got (with both springs) is $45.90. If you go together with a friend and buy two (both shipped to the same address) The cost for each would be $42, which would save you both a few bucks. 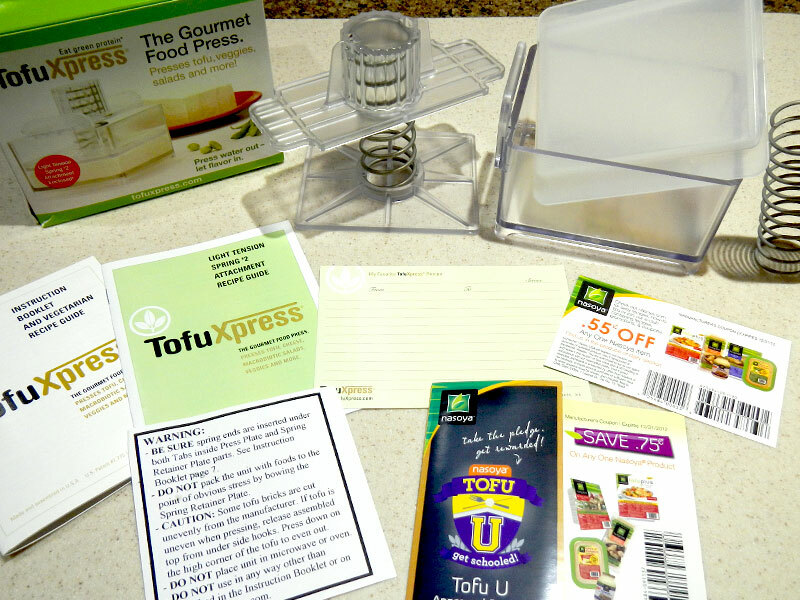 You can use this to press other things besides tofu. Want to press the water out of frozen spinach? 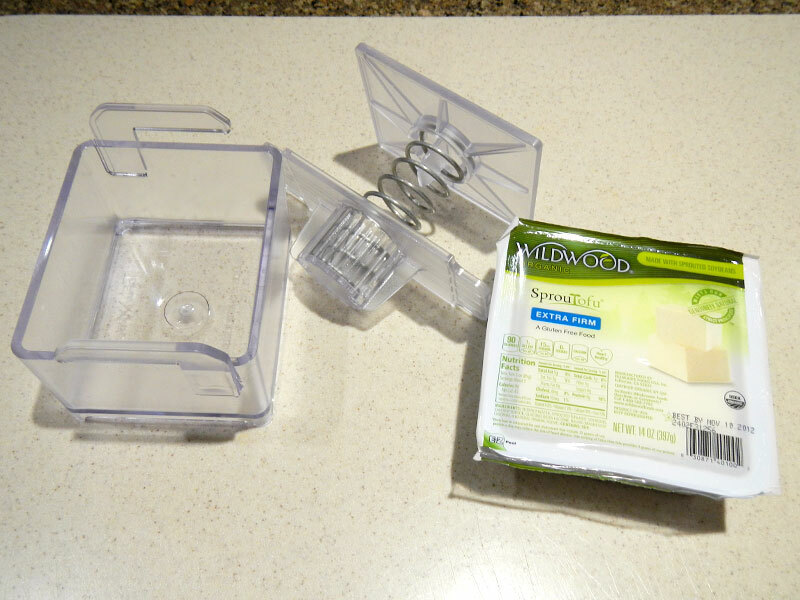 How about pressing the moisture out of a block of vegan cheese? Making a pressed salad, or squeezing eggplant? This thing is way easier than other methods! Did I like it? Yep! I love this thing. I find it much easier and quicker to deal with than the low-tech method! I’ll end up using more tofu because of it. Would I replace it if it died? Yep, as long as they don’t make the price any higher than it already is.